One of TPL's smallest Northwest projects lies in the heart of Seattle. The Blaine Street Steps climb two solid blocks up to Seattle's North Capitol Hill neighborhood. The 270 steps receive heavy use by firemen and Mt. 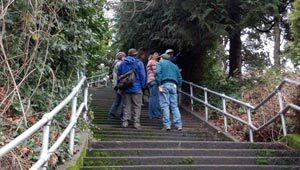 Rainier climbers in training, runners, and anyone interested in an outdoor stair-climbing challenge that tops any gym routine. The land at the edge of the stairs was attractive as a housing site with spectacular views toward the Puget Sound, and TPL and the City of Seattle worked together to protect it from development, preserving the cherished outdoor experience for everyone to enjoy. The steps connect to Colonnade Park, a distinctive freeway-covered park created at the end of 2005 that reunited Capitol Hill and Eastlake neighborhoods after decades of separation by I-5.